Thanks to a wonderful dear friend I came home my Netherlands trip with more treasured Dutch fabrics to add to my collection. The detail in the flowers is wonderful with the fine picotage dots. Imagine wearing this! 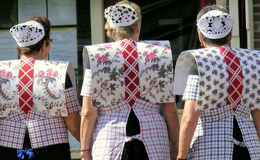 In traditional Dutch costumes several prints and plaids are used. There are many regional variations to the traditional dress and head covers. You can see Staphorst from my trip last year HERE. The use of a variety of fabrics and styles serves to tell a little story to a knowledgeable observer. Just like today what we wear to a party is generally different then what we wear doing daily errands. These dark purples prints are traditional regional mourning prints. The darker the print, the deeper the mourning. The wearer was closer to the deceased, where a light purple indicates the mourning for a person less close to the wearer. I am sure there are variations on this based on region and era. The button is the sign of Zeeland. Which means "sea land". This region of the Netherlands consists of a series of small islands with a strip of land that borders Belgium. Zealand Buttons have a special design. HERE. These fabrics are from Bunschoten/Spakenburg in Noord-Holland. Many here still wear the local garments. I might have the purple print in the wrong stack - it might be light mourning. These fabrics are used in several parts of the outfit. These prints are from circa 1960 and many of the pieces were cut from cast off garments. To put the prints in context, another friend gave me an issue of Het Klossie magazine with an article. Note the prints at the shoulder. The fabric here is heavily starched so-called "kraplappen". The fabrics are also used for the "baffles" which is the flat part of the bodice. Also, sometimes the upper portion of the skirt. and the back of the bodice. Another view showing the beautiful fabrics! Thank you to my friends who made the 2017 Netherlands trip a success - fun and informative! I was recently told the Dutch quilt community is small. It might be small but it has so much talent! 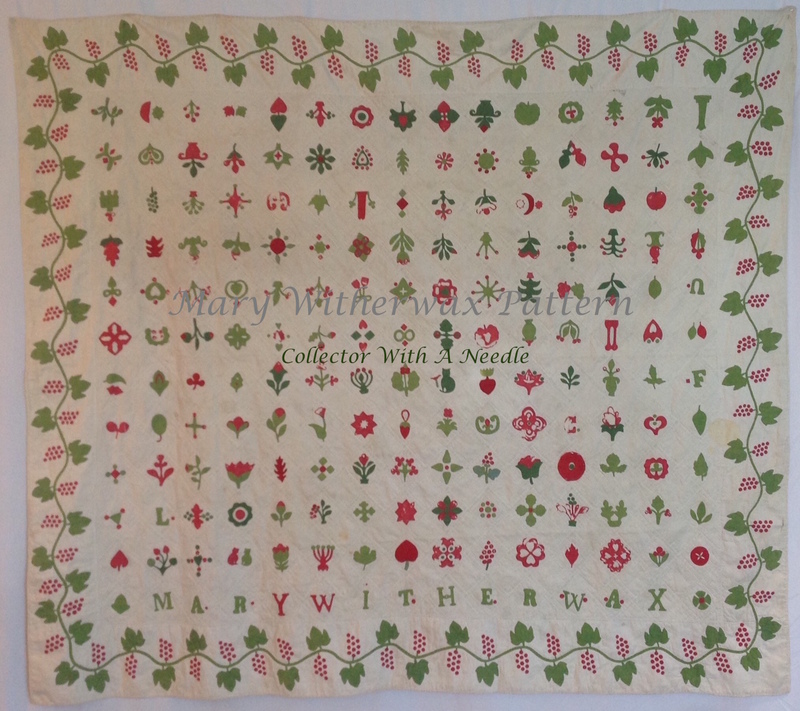 Dorry introduced me to Dutch quilter Lucy Huig-Dunnebier. I am honored that Lucie invited us into her home and studio. As we walked the beautiful tree lined canals of Amsterdam one can't help but wonder what lies behind the 400 year historic doors of canal houses. With Lucie's generous invitation, we toured her 400 year old home and studio. This wonderful staircase is the first flight of steps on the way to Lucie's Studio. 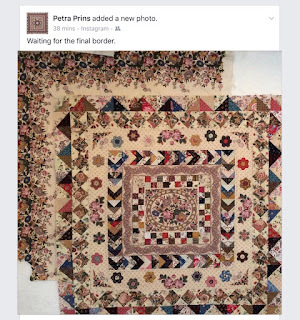 Let's look at a few of Lucie's quilts. Lucie is brilliant - her quilts are all made from 100% natural fibers. Silk, cotton or linen. 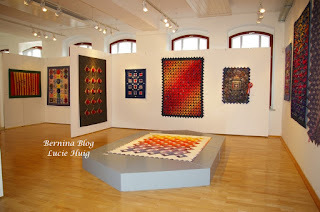 She does amazing handwork as she manipulates the fabrics in fine art quilts. In these examples Lucie folds the fabric into textural circles that gleefully swirl across the surface of the quilt. All of her quilts are hand quilted. My photos won't do the beauty of the quilts their due justice - they are exquisite in quality, color and details. This is the first room of Lucie's studio space. She draped quilt after quilt across her hand quilting frame. The room exploded in color and texture. Each work of art has a story and Lucie relates the stories with passion and detail. Quilts that change color and form as they are held in different directions. Hand applique flowers that open to reveal pure silk petals with the tiniest accents of glass gold beads. 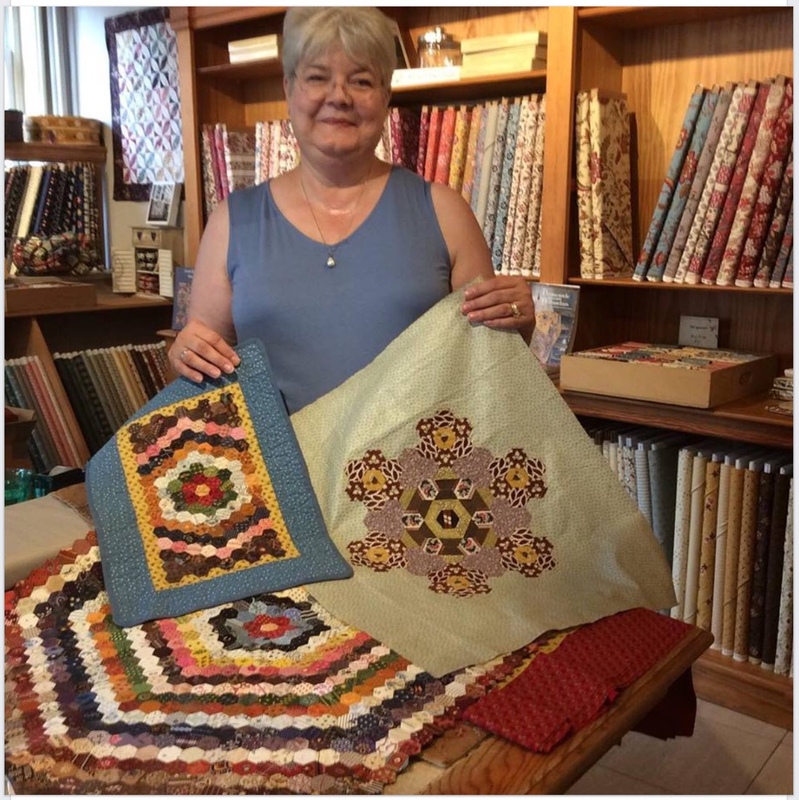 An architects daughter, Lucie plans intricate closures that facilitate the transformation of her quilts as layers are opened and closed, exposing delightful surprises in color and treasure. Lucie has exhibited and taught all over Europe. If you have the chance to see or experience these textile wonders - take it! Her ingenious way of designing, and manipulating premium fabrics like wool, silk and linen is spell binding. Add the color and texture and it is a feast for the eyes and hands. I am guessing exhibit attendees always want to touch the quilts. The quilts in this room were several layers deep. I wish I could show them all to you. Day and night backs and fronts remind children to sleep and wake with charming details. Lucie's new wool tweed piece hangs in the main front room. The rich wool glows in the sun lights. I had an instant desire to run my hand over the surface. Each square of wool was individually hand quilted. The colors are arranged light to dark as the light enters the front window and adds to the dramatic effect. Lucie collects the fabrics and then decides how she will use it. The quilt hangs from the ceiling picture rails along with her talented husbands oil paintings, adding to the gallery effect. We felt as if we were in an exhibit within each room. 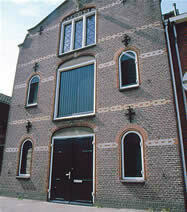 Built in 1616, Lucie's family acquired the home after WWII, with muddy windows they weren't sure what they were getting. Grateful for the opportunity of a home after the devastation they have made it a beautiful and welcoming home. I found Lucie's studies and diagrams very interesting. For exhibits she includes diagrams to assist viewers in understanding what the quilts do, how they transform and change as the surface is "opened". Since exhibits are so stationary, I can see that some people may have a hard time understanding the quilts. Lucie's hand stitches are beautiful, and enhance each quilt. They are the subtle finish to the intricate surfaces. The second room of her studio includes a large window overlooking the canal, her cutting table and shelving for her fabric collections. What a beautiful space to create! Lucie had several quilts with children in mind. Compartments that opened to reveal treasures like baseball cards, dinosaur figures and rocks - special places for a child to stow away treasures. As the treasures are placed in the front compartments, the quilt can be flipped to the back. The back reveals a sleepy theme such as a moonlit sky and twinkling stars - encouraging sleep and sweet dreams. Each quilt back is as interesting as the front. 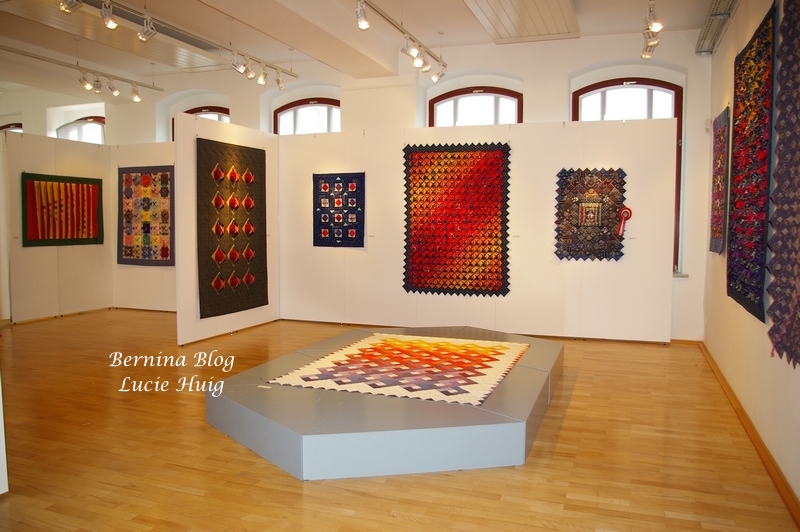 Each of her quilts truly embodies what a real art quilt is. You never know what's behind those historic facades that line the canals, and now we can say we toured one. Lucie's home is on this poster charting out the canal homes. Thank you very much Lucie for generously sharing your home, quilts and art with us! Please leave a note for Lucie in the comments. 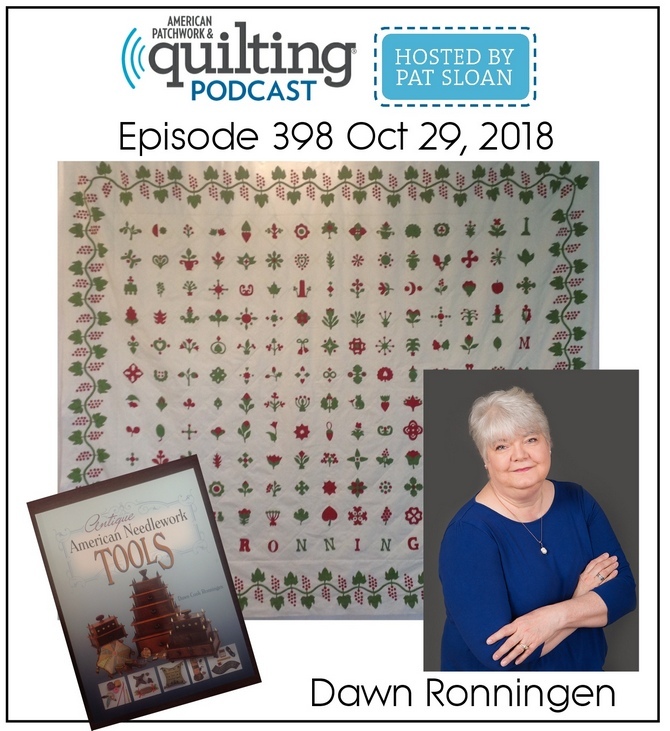 While in the Netherlands I shared some of my hexagon quilts at Quilt It Dotty. Quilt-It Dotty, (Dorry van Osch) a quilt shop in Overloon Netherlands hosted me. Generous, gracious exceptional hostess! She booked two full days of fun! The hexagon program we did Saturday we repeated with another group on Sunday. I am so thrilled with their interest in antique quilts. This is a view from the kitchen door - looking through the French door window panes into the great room. The quilts are laid out ready for the lecture and trunk show. This room was later transformed into stitching space for the afternoon workshop. Dorry's Shop, Quilt-It-Dotty is filled with wonderful fabrics and trims, gift items as well as women's clothing. The shop is light and airy - a happy place to gather. Attendees had so much fun shopping, we had to hurry to make the program - it was fun! Sorry started everyone off with wonderful baking from the Aga and fresh coffee/tea. Dorry set up beautiful seating all over her gardens. Quilts adorned the seating while fresh flowers were on the tables. Large shade trees provided comfort from the noon sun. The weather was beautiful so lunch was served outside. Delicious gourmet lunch was served with elderberry lemonade, tea and more baked goods! 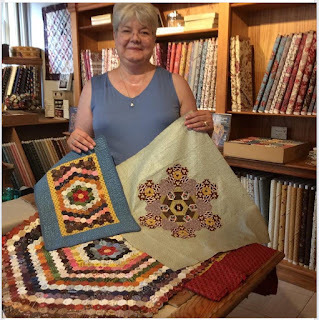 I bought a few little extra pieces of antique chintz to share after ahttp://hesterpatchwork.blogspot.com/2017/10/hexagons.htmlhttp://hesterpatchwork.blogspot.com/2017/10/hexagons.htmlhttp://hesterpatchwork.blogspot.com/2017/10/hexagons.htmln online discussion about the "hand" or feel of 19th century chintz. Always fun to share a little something extra. Everyone got to see and feel the antique fabric. The attendees were fun, attentive, curious and a joy to spend time with! I hope they enjoyed the days as much as I did. Also thank you to the ladies who brought show and tell - amazing quilts! Please let me know if I can add more links here! Dorry will have many of her patterns converted to English soon! Including the medallion quilt in the picture. She has some family history on this Dutch treasure so stay tuned. The next part of our adventure takes us to the Fries Museum in Leeuwarden, Netherlands. I took more than 500 photos and was almost speechless at the quality of the articles on display. It was a stunning exhibit of Dutch Chintz in garments, quilts, hats/bonnets and home goods. I think the exhibit is now closed. The exhibit book was not printed in English, but I purchased it anyway. With Google translate and the photos it was worth the price. This sign tells how cherished the chintz is. It is carefully preserved and cared for. The Frisians were wealthy enough not to wear their clothing out. Their chintz rich traditional costumes and related items were carefully preserved. The children's garments are in exceptional condition. Larger worn garments could be remade into smaller articles. 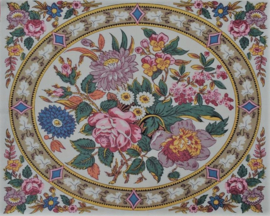 Chintz also had a second life wine used for linings in blankets, bed capes and cloaks. This was my favorite dress. India, second quarter 18th century. Painted and dyed using the chintz technique. 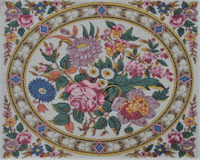 The cut outs show incredible embroidery. The skirt was also magnificent, not to mention the neck scarf. It is in the collection of the Fries Museum. The dolls and doll clothes were very detailed. This doll wears a wool under dress with a chintz apron and cap. Dates first half of the 18th century. It is in the collection of the Fries Museum. This doll was displayed with a mirror under the feet so you could view the layers of petticoats. Next to her was an oak chest of doll clothes. Numerous outfits all made in chintz. Even the straw plaited doll bonnets were trimmed in chintz. Infants were wrapped in specially shaped 'blankets', secured closed with ribbons. I think these are "wikkelkleed". Dated second half of the 18th century. This infant sized doll, wearing a chintz bonnet, is shown wrapped in the (wikkeleeded) somewhat "T" shaped blanket. printed cotton from Oberkampf cotton printers. Numerous examples were in the exhibit. There were quilted petticoats, stomachers and quilts. This quilt is still in the makers family. Joes Meester is the owner. It is a double sided quilt. The other side is quarter square triangle blocks. 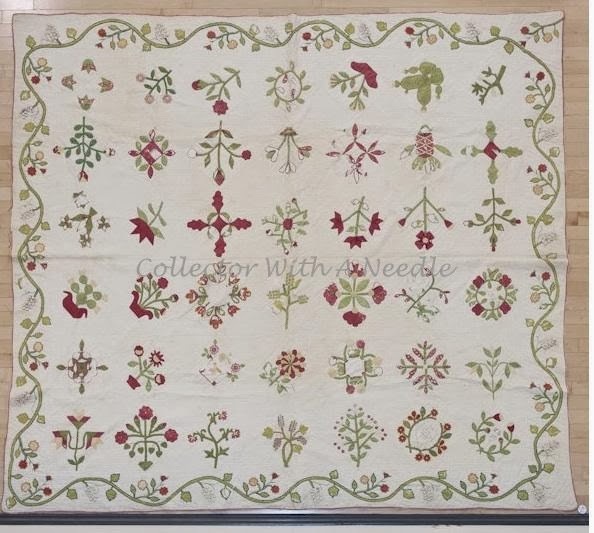 A wonderful reproduction fabric line was produced from fabrics in this quilt, titled, "Josephine". Thank you for joining me for part 2 of the trip. Did you like the exhibit? We are home from our trip to the Netherlands. Velma had a nice time with the house sitters, but was very happy to have us home. She has been my shadow every day! Only a sunny patch in the window keeps her away. Please continue - as I take you through Part One of our travels. Our first couple of days after arrival we take it easy. Why hurry? We are on vacation! There is so much to see and do in Amsterdam before we take off to other parts of the country. Landing at 6:30AM local time, we try to stay awake and moving! Options include luggage lockers prior to check in at the hotel or concierge services at the hotel desk. After taking the train from the airport to Central Station, we were fortunate to get early check in at our hotel. We were able to shower and freshen up. We took a morning canal ride and soaked in the sunshine. We enjoy seeing the construction techniques. This is stonework on a bridge we cruised under. This is the famous spot where you can see the arches of seven bridges in a row. Click to enlarge, maybe you can see them too. The fresh air and slight rocking of the boat could have very easily lulled us to sleep! The beautiful sights and sounds kept us energized. We also had tickets for a wine and cheese pairing. We learned about the aging (ripening) of cheese on wood shelving. The wheels can be aged to about 2 years. Very large mature wheels of cheese are then sent to market where they are sampled and auctioned. We had five cheeses with three glasses of wine! Then, a sixth cheese paired with a glass of Port. It was magnificent. We were advised to find the true Dutch cheese in the USA - check Whole Foods. Evidence of an early afternoon well spent. This was the leftover wine. The "pours" were generous and we couldn't finish all of it! Of course I had to visit Den Haan Wagenmakers. I was fortunate to meet Petra and Elsbeth. They even wanted to see a couple of my little quilts. What an honor. I was fun to see the hexagons Elsbeth was working on in Dutch Heritage fabrics. Petra shared her new Dutch Heritage fabric lines. Of course, I placed and order. They are all so beautiful. This is the new panel. 10" x 11.5" - of course wonderful quilt shop quality fabrics. Check out the project and matching border prints. You can order yours Click HERE. I was told it is only available in the Netherlands. * The postage will not calculate correctly! The shop will adjust the postage to reflect the actual amount when they ship it. The postage will look very high as you checkout. While it isn't as low as ordering from within the US, it is a web shop issue. * The pattern or kit is designed to also use your stash. The center panel, second border print and final floral border are all you need - along with your stash! After my first quilt shop visit, (more quilt shop info in part 2) we went antique shopping. On my last visit here I only had an hour. So, this trip I made sure I had more time. I did make some purchases this time. 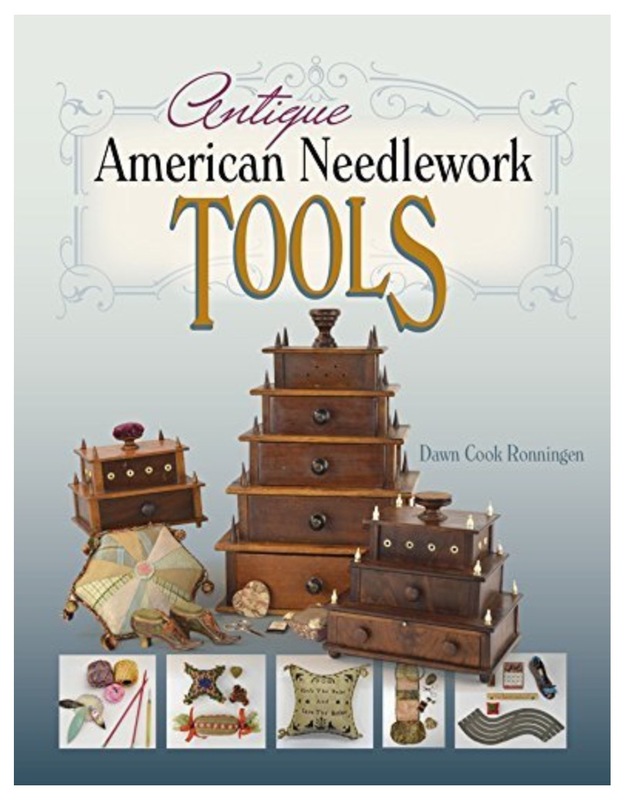 Those I will show you in a future post, dedicated just to Dutch antique needlework tools. It was early to bed and up the next day for some touristy things! We went to Zaanse Schans to see the windmills. The sky teased us with potential rain, but stayed dry. It was refreshing to be out on the water. One of the most interesting windmills to me was the color mill. Beside the mill was a storage shed with 17 shutter units that were opened and closed to facilitate drying. Pigment is used for coloring many things, textile pigments interest me most. The operation and staffing of the windmills is done as part of a heritage/history program that keeps the mills functioning as they did centuries ago. We were allowed to enter the windmills, and even climb up to the balconies. I couldn't help but think in the US, they probably wouldn't be operating and any are potentially dangerous would be roped off and off limits. We loved exploring the old timbers and stone. We were lucky to leave before bus loads of people descended on the little village. Back to Amsterdam we went - ready for some sleep. Dreaming of our next adventure to Leeuwarden! Stay tuned for Parts Two, Three and Four. Thanks for coming along for Part One.